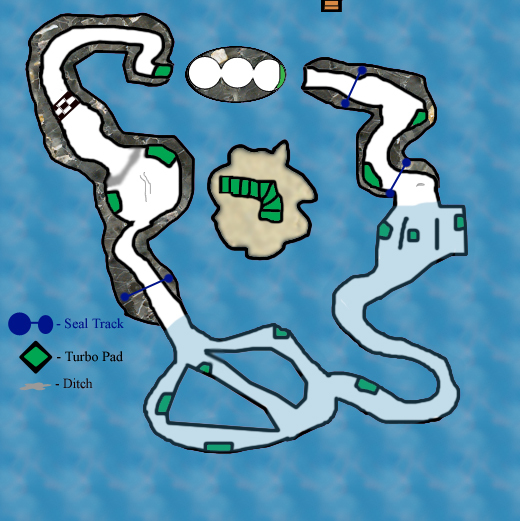 Penguin Kart (game) is a high quality article, which is awesome! 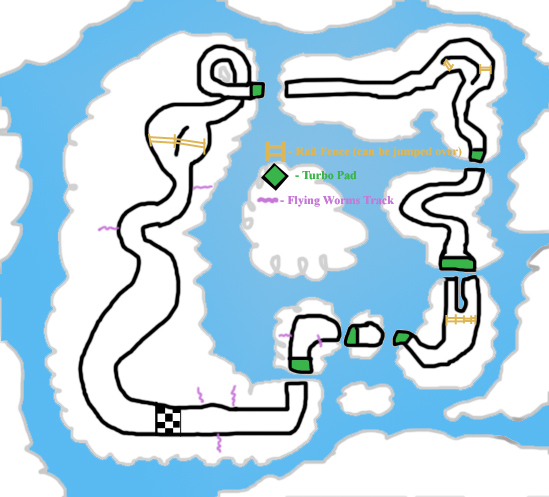 Penguin Kart is a racing game made exclusively for the Snowtendo Vii, the entire story is about the racers trying to enter a racing tournament and stop Darktan. It was released in the entire USA in July 28, 2009, in Dorkugal in June 15, 2009, in the Free Republics in September 5, 2009, and in the UnitedTerra in September 21, 2009. 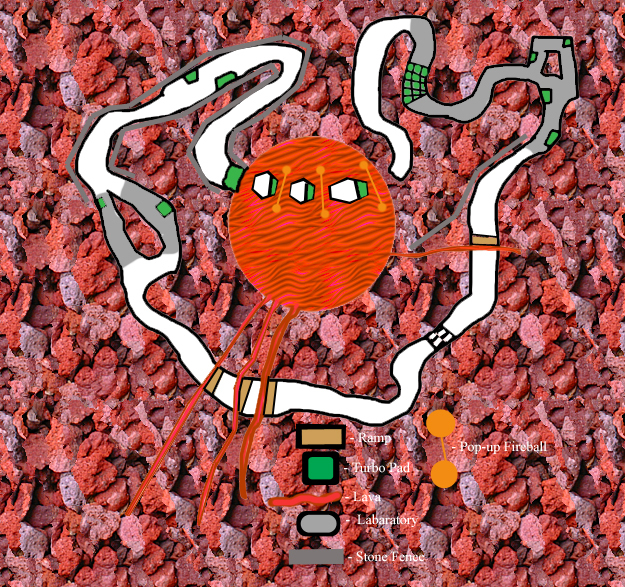 The game was first tested in Dorkugal and was also released there first. Many penguins enjoyed it because of all the fun in the game. 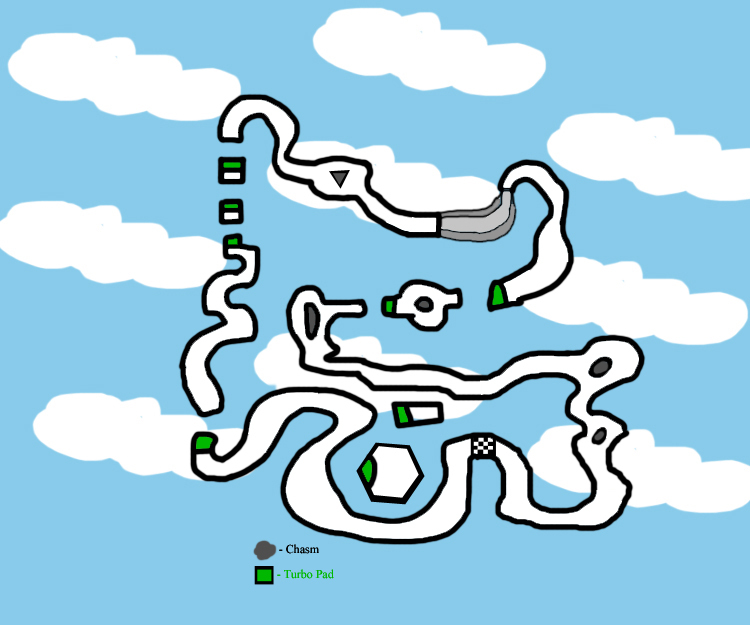 The game with unique graphics and psychics, Penguin Kart is a racing game in which the player controls characters from the entire USA, most of the characters drive in vehicles, while others just run and hover over the track. The vehicles can be rode on by any character if it's unlocked, although, before they are unlocked, all the racers drive/hop in regular go-karts, bicycles, motorcycles, skateboards, scooters, roller skates, sleds, and even run over the entire track with their bare feet. While racing, the player can accelerate, steer, reverse, brake, hop, collect coins, or use weapons and power-ups with the Viimote. 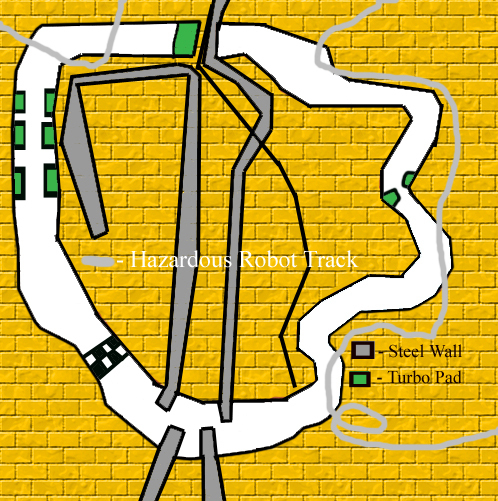 There are three type of boxes located on each track. 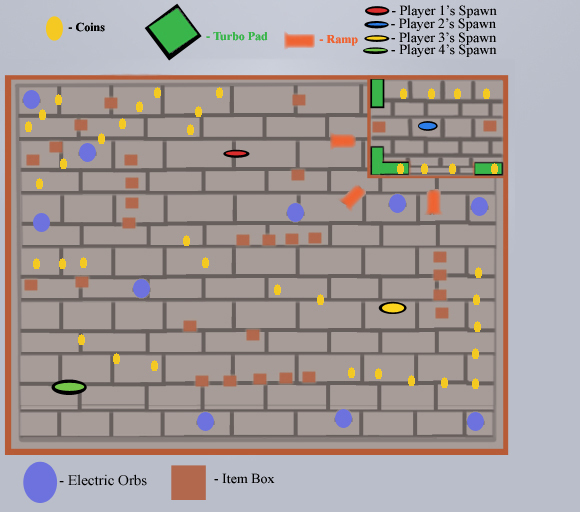 The boxes, from most to least common, are the regular item boxes, the coin boxes, and the glowing item boxes. If any of them are smashed, something happens. Boxes with a question mark on them holds weapons and power-ups, which can be obtained by driving through and breaking apart the item box. When the player collects a weapon or power-up, it will appear in a box at the top right corner of the screen. The player can then activate the weapon or power-up to attack other racers or gain more speed. The glowing item box is rarer than the regular item boxes, but they like alike with the exception of it being covered with a green glow. Breaking one can give the player a special weapon or power-up to activate it or a various amount of coins. 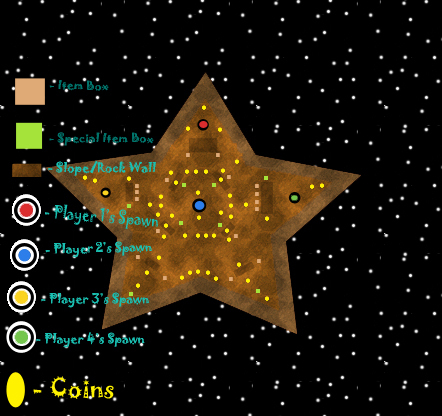 Coin boxes carry coins that increase the speed of the player's vehicle and strengthens the player's weapons and power-ups if ten of them are obtained. While playing the game, the player must use the Vii Mote in a horizontal direction. Activate special power: Press the A button after you get your special power./Press the C button after you get your special power. 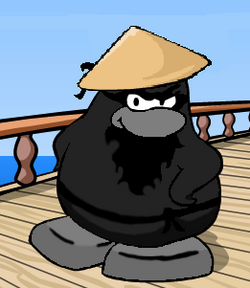 Once upon a time in Club Penguin Island, it was a normal day, until ... dark clouds started to appear everywhere in Antarctica, then a familiar evil laugh came from Darktan. News reporter Mickeybb1 appears in all of the TV screens in Antarctica, saying that the entire Antarctica is surrounded by the dark clouds and Darktan is responsible for creating them, if anyone defeats Darktan in a racing challenge, the Antarctica is safe, but the racer must race through different tracks in order to challenge Darktan, and then the rest of the people start building their own karts, not only that, but the winner also gets a reward on their own picking. But if the racer did not beat Darktan, then Darktan has to turn the entire citizens of the Antarctica to become Darktan's minions for a long time. Meanwhile, in a subplot, Fudd looses his tuba to Darktan and decides to take it back by blowing up the castle! After the Antarctican driver defeated Captain Str00del of the Darktonian Realm, Darktan is still nowhere to be found while a mysterious cave opens up, the driver then drives into a cave, suddenly, Darktan appears in a big screen, he says that he is located somewhere else in the outskirts of the Darktonian Realm and he is waiting for the driver to challenge him. Meanwhile, the driver unsuspectingly defeats Darktan in a race, the evil penguin then has to give up the plan and do something else better for him. After the rise and fall of Darktan's Plan happened, the driver, along with some of the playable characters, celebrates in the Darktonian Realm, and then the credits appears. After the credits a bonus ending is shown. In it Fudd grabs the tuba from Darktan and runs out of the cave just before it explodes. Out of the cave comes Darktan who throws a boot at Fudd and it hits him in the face, much to the enjoyment of the other racers. Penguin Kart has a wide variety of characters. You can unlock certain ones. There are some hidden characters, too. All vehicles can be chosen to have different patterns or different colors by editing in Vehicle Editorial mode which is included in the Options menu, you can also add some different features in the vehicle as well, regular vehicles, such as the regular race kart, has grayish colors on it. 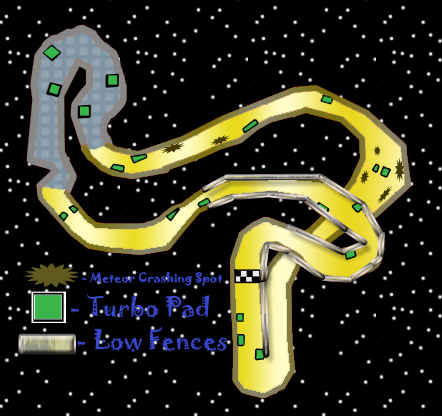 Note: Some of the player's opponents uses the Regular Race Kart, Regular Motorcycle, Regular Bicycle, Regular Skateboard, Regular Scooter, Roller Skates, Running Style, and Regular Racing Sled before you unlock the vehicles below them. It looks like: the character of your choosing of course. To make it available for other racers, the player must completing the Fish Cup in easy difficulty. It looks like: a Rocketsnail-inspired racing sled. 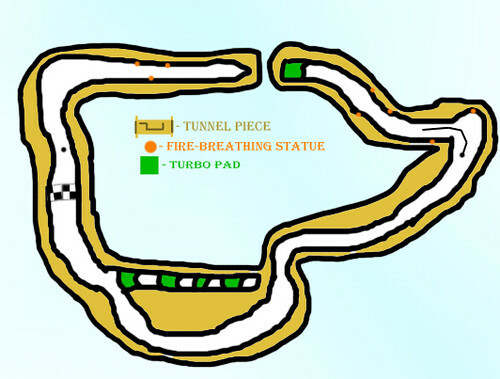 To make it available for other racers, the player must completing the Flame Cup in medium difficulty. It looks like: a blue biplane suitable for a road trip. To make it available for other racers, the player must completing the first four cups in the Grand Prix mode. To make it available for other racers, the player must completing the last four cups in the Grand Prix mode. It looks like: a green biplane suitable for a road trip. 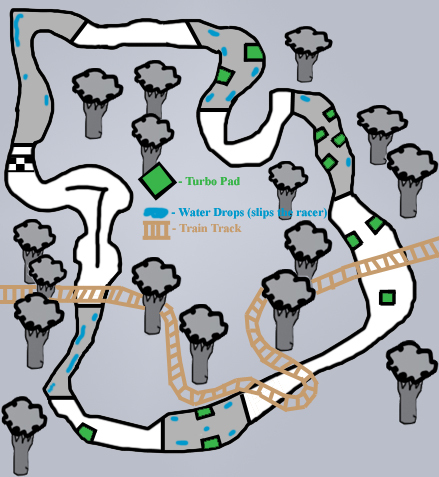 To make it available for other racers, the player must winning 10 races without using an item. It looks like: a fish-styled convertible. To make it available for other racers, the player must winning 25 races without using an item. It looks like: the PrankMobile from Let's Prank Charon!. To make it available for other racers, the player must completing the Flame Cup in easy difficulty. It looks like: the Mechanical Woodchopper. To make it available for other racers, the player must completing the Coin Cup in medium difficulty. It looks like: a trapezoid-shaped go kart. 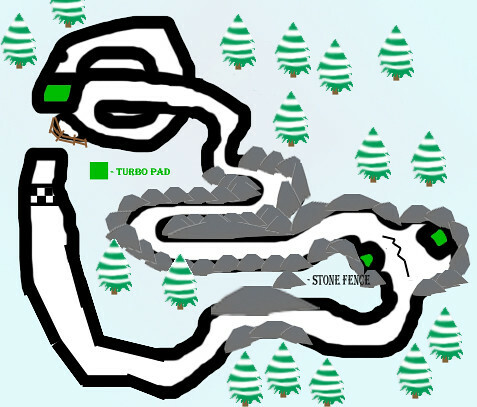 To make it available for other racers, the player must completing the Turbo Cup in hard difficulty. It looks like: a plastic children's tricycle. 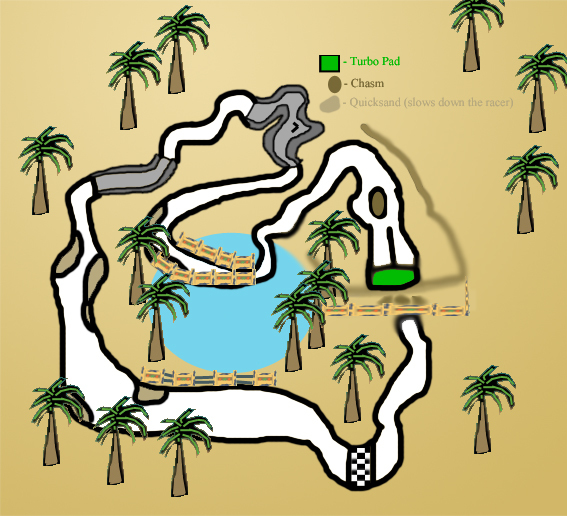 To make it available for other racers, the player must completing the Excel Cup in easy difficulty. It looks like: the Prank Mobile, but it has a quadracycle body shape. To make it available for other racers, the player must completing the Flame Cup in hard difficulty. It looks like: a fire-textured, three-wheeled motorcycle. To make it available for other racers, the player must completing the Excel Cup in hard difficulty. It looks like: a sliced coconut with car features. To make it available for other racers, the player must completing the Maximum Cup in easy difficulty. It looks like: A computer on wheels. 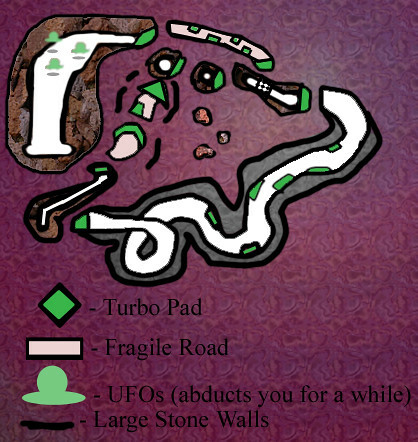 To make it available for other racers, the player must having all of the jeweled keys in Adventure Mode. It looks like: a robot that is shaped like a tourer. 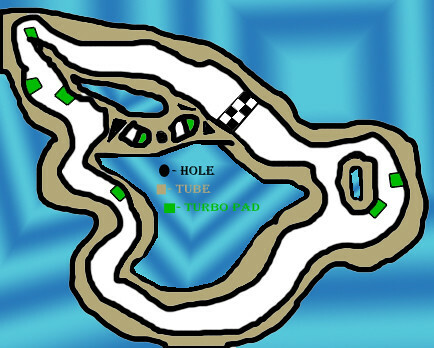 To make it available for other racers, the player must completing the Excel Cup in medium difficulty. 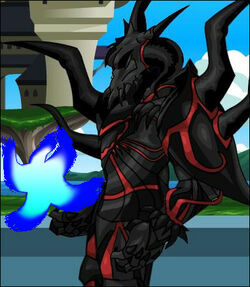 It looks like: a dragon-themed vehicle that has the body shape of this vehicle, but with extra dragon wings. To make it available for other racers, the player must completing the Maximum Cup in hard difficulty. It looks like: a medium-sized jeep that inspires the Str00del Force. To make it available for other racers, the player must completing the Maximum Cup in medium difficulty. It looks like: a floating broomstick of course. To make it available for other racers, the player must unlocking all achievements. It looks like: a metallic and a rustier version of Fast n' Frozen. To make it available for other racers, the player must defeating all Pen Chi ghosts in Time Trial mode. It looks like: a transparent F1 Car. To make it available for other racers, the player must defeating all Darktan ghosts in Time Trial mode. It looks like: a roofless limousine with a rocket for an engine. To make it available for other racers, the player must winning 10 Coin Challenges or by unlocking Flywish. It looks like: a blue car with a spoiler on the back. To make it available for other racers, the player must having a record of 150 stunts in Stunt Arena mode or by unlocking Brown51brown. It looks like: Smasher's kart from Smasher Kart Racing. To make it available for other racers, the player must unlocking Smasher. It looks like: the rocket wagon in this picture. It is unlocked if the username is Fudd. It looks like: a car with a stanhope body with a throne for a seat. It is unlocked if the player unlocks Akbaboy. It looks like: a Snowkorsky MH-53 helicopter with a large gun on the front. 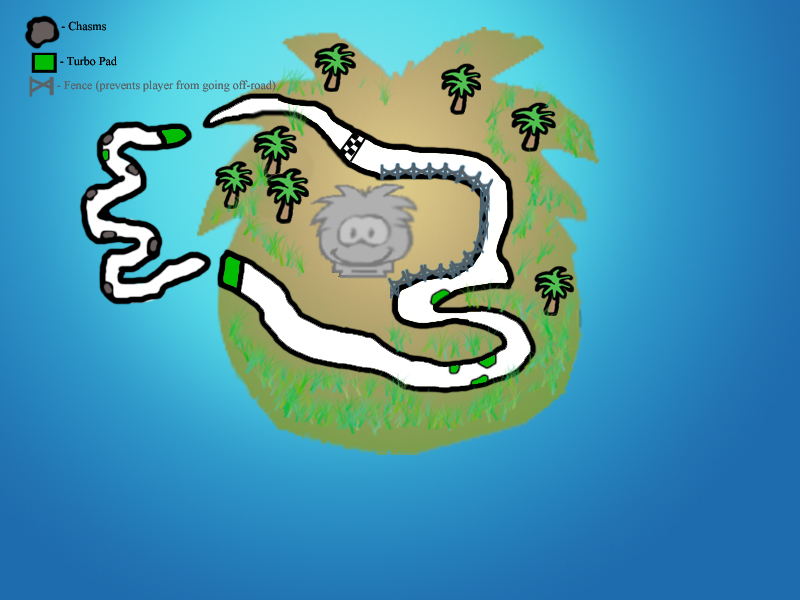 To make it available for other racers, the player must unlocking Sheepman. It looks like: All puffles that ever existed squeezed into one. 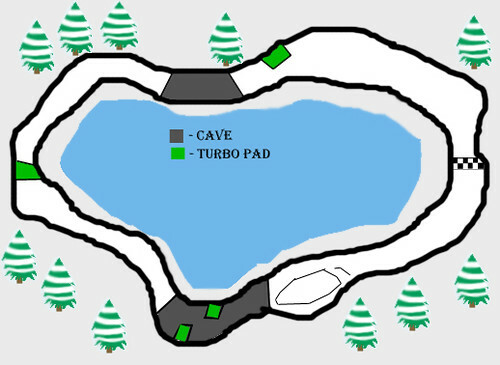 To make it available for other racers, the player must beat the Red Snowball Cup on it's hardest mode. To make it available for other racers, the player must. 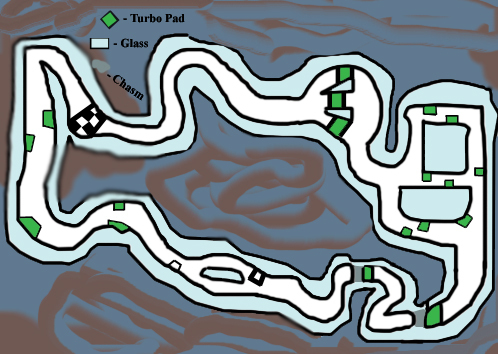 Free Fast is a single-player mode where the player can race quickly on a different race track against different opponents, the player can set how many opponents that he/she have, the minimum is one opponent, the maximum is twelve opponents, occasionally, unlockable characters are seen racing in the track after the player unlocks one of them. The Battlerina mode is where drivers destroy each other's vehicle on a arena. The first driver that destroys at least 10 vehicles is declared the winner, there is also a damage meter shown in the right screen, when it is green, it means that the car haven't gotten any damage yet, when it is yellow or higher, it means that the car have suffered a damage, up to four players can play this unique mode as well, but if the player doesn't have any friends, the player can still play, but the 2nd, 3rd, and 4th player are replaced by CPU drivers. The player can change settings for the items to disable or enable them. The Battlerina mode can also be exchanged with Coin Collecting mode by using the options menu. In the Coin Collection mode, whoever gets the most coins wins, if both players gets the same amount of coins after the time is up, it will end up being a draw. Unlike Battlerina mode, this mode can only be played if the player has two or more controllers and more friends. 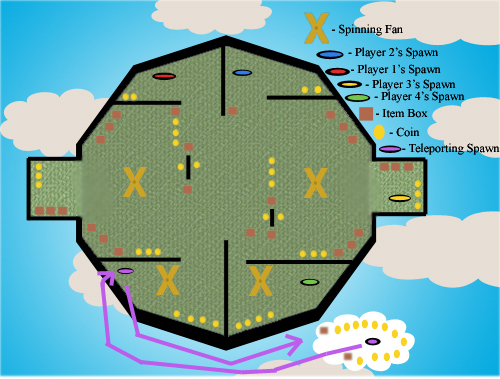 The Battlerina mode can also be exchanged with Stunt Arena mode as well, the Stunt Arena mode is a mode where the player can perform different stunts, from backflip to frontflip, the player can do many different stunts. 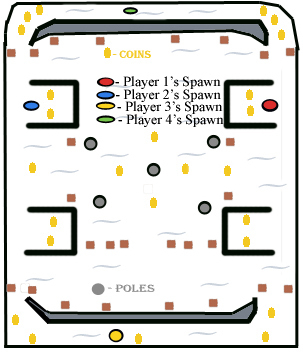 This mode can be played with two, three or four players as well, whoever has the most points before the time runs out wins. In single player, the player must do different stunts to get points before the time runs out. It's exactly like the Free Fast mode, except that you can play with your friends in this mode, a multiplayer grand prix mode is a subsection in this mode. The player can also decided to include CPU racers or not. The Time Trial mode a single player game where you race against the clock to get the best time. It's pretty much like multiplayer race, except that you can race with anyone in the world with Vi Fi Connection. The options mode is where you can change the settings for the game, for example, the higher the difficulty, the faster your opponent's speed, the slower the sound and music, the more quite the game listens, and you can save a game data as well, if the game is played by more than one person and if they want to create separate profiles in the game, they can create an another profile as well, if the player wants to get rid of their old data, they can also delete their old data as well, and here in the options menu, there are two neat goodies, there is a sound testing menu and a vehicle editorial menu, the sound test menu is where you can hear the musics, sound effects and voices in the game, it could be unlocked by unlocking pretty much everything else first, the vehicle editorial menu is a sub-mode where you can edit a vehicle to change it's color, patterns, textures, or even add a new feature! It could also be unlocked by getting all vehicles in the game. There are over nine thousa-I mean, there's over fifty achievements that the player can earn, it can be important if the player wants to unlock something. #1 The Winner of the Race is... Easy Win a race track in 1st place. #2 No Weapons! 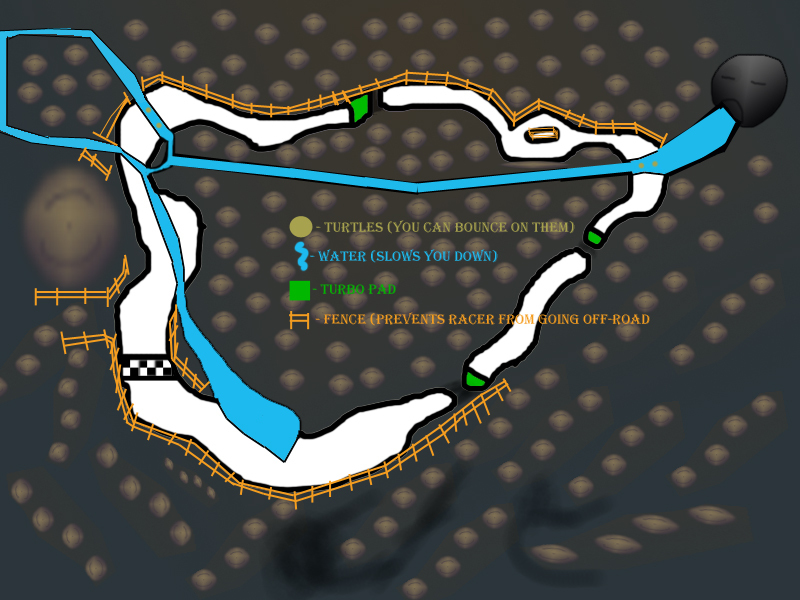 Easy Win a race track without using any weapon. #3 Grand Prix Winner Moderate Win a grand prix cup. #4 Story completed! Moderate Complete the adventure avenue with 100% or more. #5 The Sneaky Way! Moderate Use a shortcut in race track to get in 1st place. #6 Time Master Hard Defeat all of Pen Chi's ghosts in the time trial mode. #7 The True Time Lord Hard Defeat all of Darktan's ghosts in the time trial mode. #8 Keys, keys, and more keys! Moderate Collect all bronze, ruby, or onyx jeweled keys in adventure avenue. #9 The Heavy Artillery Easy Use a weapon in a race that can go in different directions and successfully attack the racer. 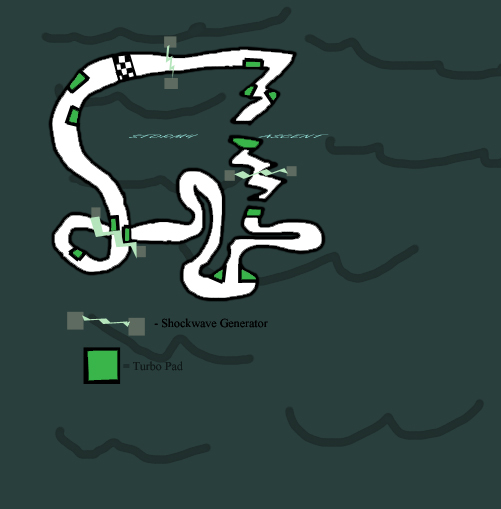 #10 Power Slider Moderate In a race track, do at least 15 consecutive power slides. #11 The Grand Master of Grand Prix Cups Hard Win in 1st place in all of the grand prix cups in hard mode. #12 Racing Champion Moderate Win in 1st place on all race tracks at least in hard mode. #13 Coin Collector! Easy Achieve more coins than the second player in a coin challenge battle. #14 Look out, world. There's a new racer in town, and his name is... Easy Win at least 1 race in online mode. #15 Going up! Easy Win at least 10 races in online mode. #16 Turbonator! Moderate Win at least 25 races in online mode. #17 Expert Online Racer Moderate Win at least 50 races in online mode. #18 Survivor Series Easy Be the first one to have at least 10 knockouts in a battle arena. #22 Wooden Spoon Award Easy Win a race track in the lowest place. #23 Boss Beater Moderate Defeat a boss in adventure avenue. #24 You're doing it wrong! Easy Fall into a chasm while racing in a track. #25 Coin Collector at a track Moderate Collect all of the coins (except for the ones that is contained in the coin box) in a race track. #26 Puffle Token pieces, coming right up! Moderate Collect all six token pieces in adventure avenue. #27 The Wrath of You Easy Use a special weapon against a racer in a track. #28 The Demented Way Easy Use a special weapon three times in a race. #29 I'm Invincible! Moderate While racing, don't get hurt by any items. #30 Mixed Up Together and... Easy Use a mixed up item on a racer in a race. #32 Expansion Extension Moderate Install an expansion pack to your game. #33 Veteran Racer Moderate Race in 1st place on all racing modes. #34 Off-Roader Easy Stay in the off-road side of a track for at least six seconds. 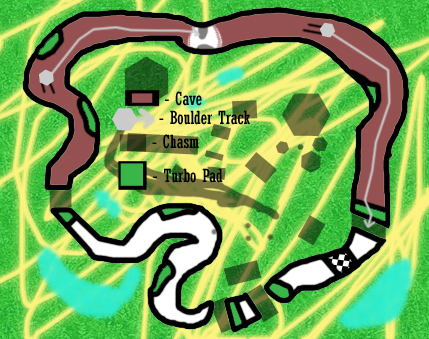 #35 Accident Prone Easy Get hit by an item, and fall into a chasm on a track. #37 One Stunt Easy Perform at least one stunt in stunt arena mode. #38 AtTENtion! Easy Perform at least ten stunts in stunt arena mode. #39 Twenty Five Files Moderate Perform at least twenty-five stunts in stunt arena mode. #40 Fifty-fifty times! Moderate Perform at least fifty stunts in stunt arena mode. #41 Seventy-five percent! Hard Perform at least seventy-five stunts in stunt arena mode. #42 Over 100! Hard Perform at least hundreds of stunts in stunt arena mode. #43 Argh! You Cheater! Easy Use a code to unlock an item. #45 D'oh! Easy Fire any projectile item, and let it be missed. #46 Whoa! Easy Get hit by an item while you're surrounded by an energetic shield. #47 Get up on your feet, bud! Easy Do nothing for 60 seconds in a race track. #48 The Coin Keeper Easy While racing, have at least 10 coins while going through the finish line. #49 Face Fudd's pie! Extremely Hard Beat Fudd in a multiplayer game without getting by his special weapon once. #50 Game Completed Hard Unlock everything in this game. #51 Congratulations! Extremely Hard Unlock all achievements for this game. 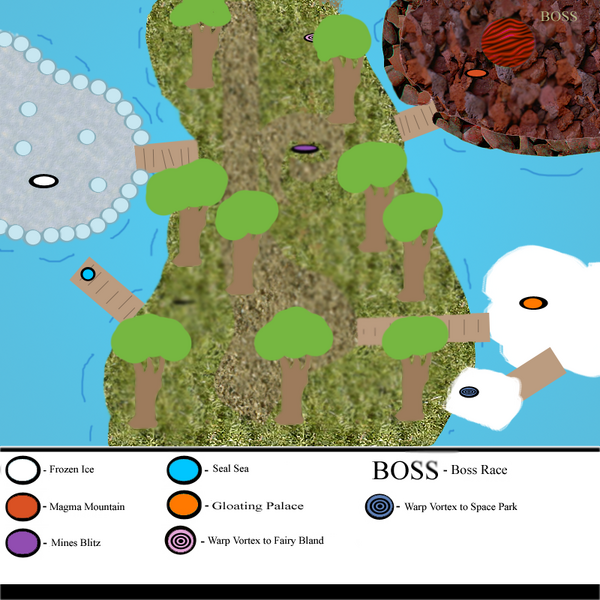 All of the boss characters can't be used in Adventure Avenue. Adventure Avenue is the adventure mode of the game, the player must use the character of their own choice and must race through all events in order to race against Darktan to save the world, the player can also unlock some characters as well. The player can earn a trophy by finishing first place in a trophy race. Collecting all four trophies can earn the player a boss race. After earning a trophy from one race, another one will open. 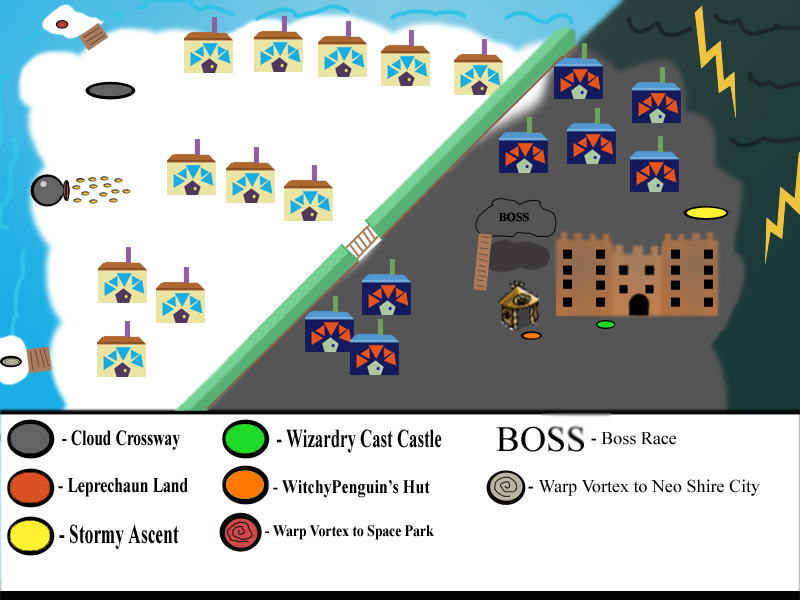 Boss races are unlocked after the player earns at least four trophies in a different world. Vortex Accesses are obtained by defeating the boss of each different world, after that, a vortex appears, if the player goes inside the vortex, they may go into a different world with different tracks and themes. Jeweled Key races are unlocked after winning a trophy race in the same track. There are three different colors for the key, they are: Bronze, Ruby, Onyx. The bronze keys are the easiest one to collect, while Onyx and Ruby keys are harder to get. If the player wins a jeweled key race, an jewel key is awarded to the player depending on their final time spending on the track. In jeweled key races, the item boxes and the coin boxes are replaced with a time box, if a time box is hit, the time will froze for 1/2/3/4 seconds, if the player breaks all the time boxes, they will get a perfect bonus, decreasing their final number by ten. If the player earns all jeweled keys, the player can race against Darktan two times and unlock extra tracks to play in different modes. Just like the jeweled key races, the token races are unlocked after winning a trophy race. 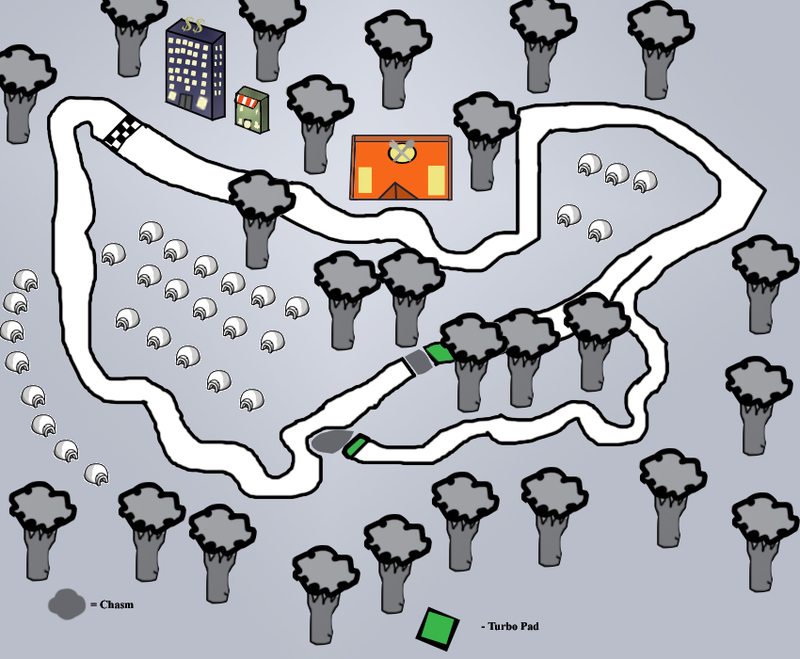 While racing in a token race, the player must collect all six puffle token pieces, if the player managed to get all six pieces and win in the first four, a puffle token is rewarded, however, if the player is one of the first four and did not collect any puffle token pieces, the token is not rewarded apparently. There are nine different colors for the puffle token pieces, the blue, red, yellow, green, purple, pink, black, and white are earned in token races, while the orange puffle tokens are earned after collecting all coins in a battle arena. 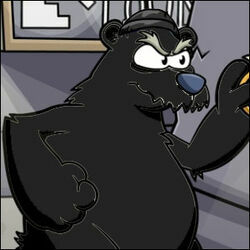 Red unlocks Herbert P. Bear. It is possible to have 101% or 102% completion without cheating. This is where the player successfully completed Adventure Avenue, with jeweled keys at ruby (101%) or all jeweled keys onyx. 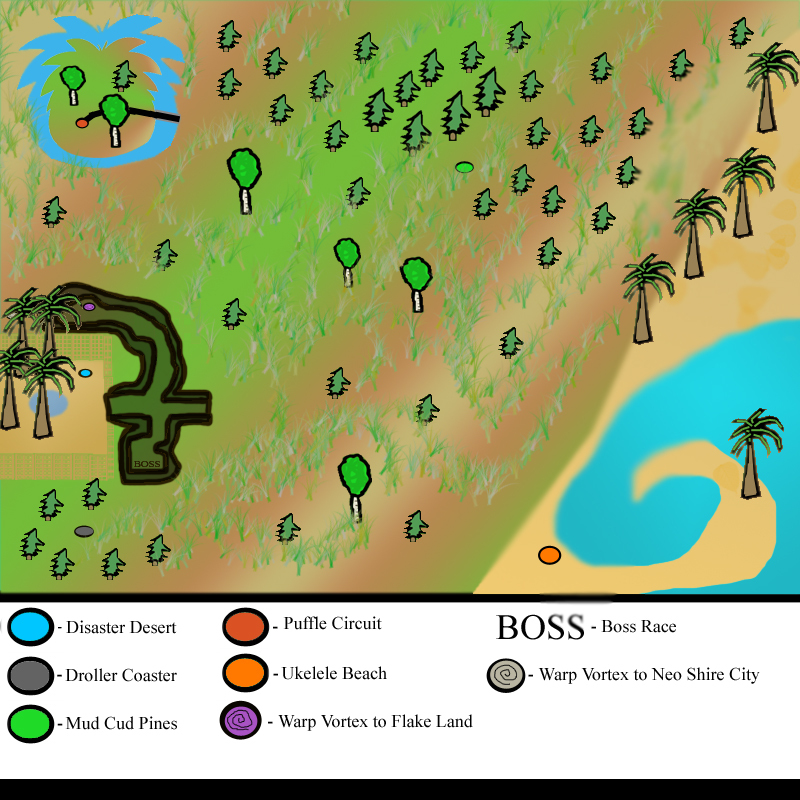 Scroll down to see the all the tracks and boss fights in the game. Click on the track name to see the map and it's music. 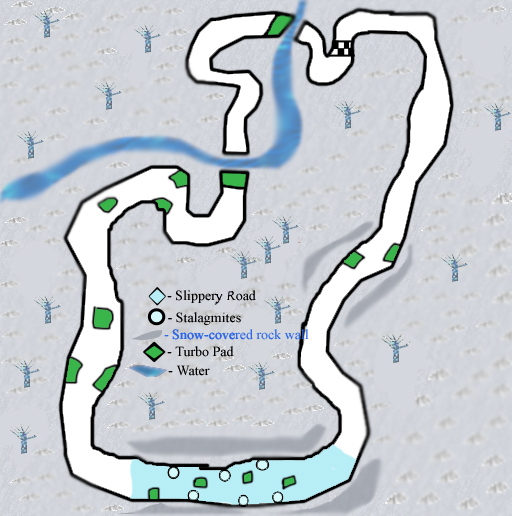 The winter-themed portion of the adventure mode. 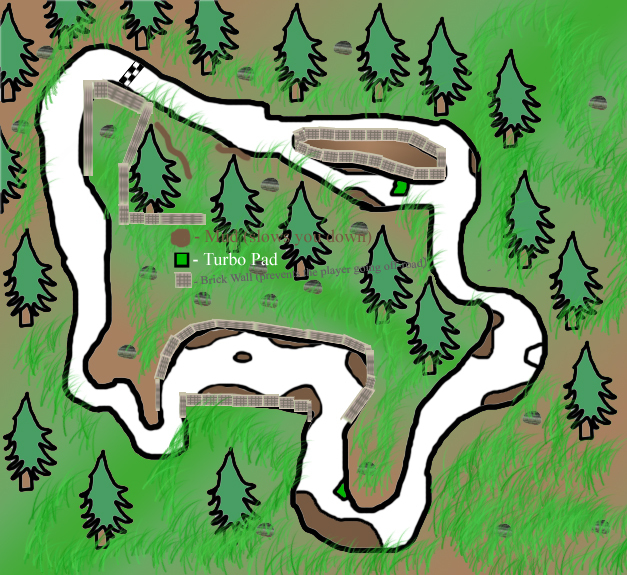 The forest-themed portion of the adventure mode. 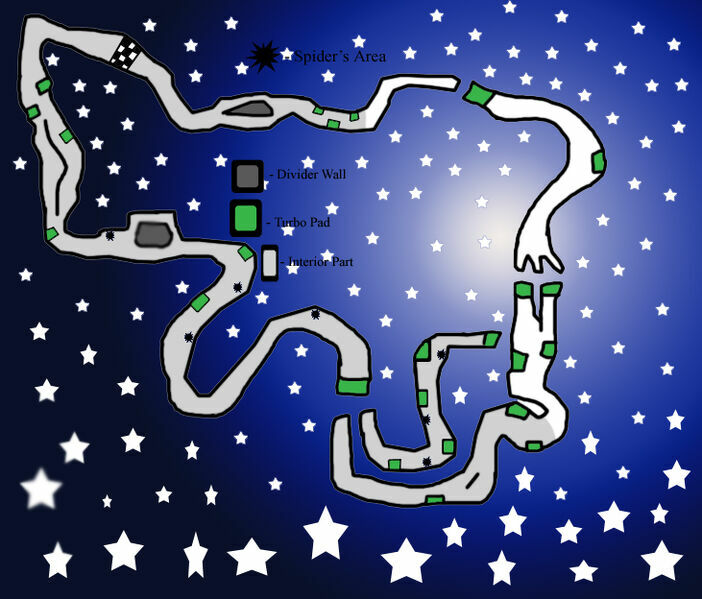 The nighttime city-themed portion of the adventure mode. 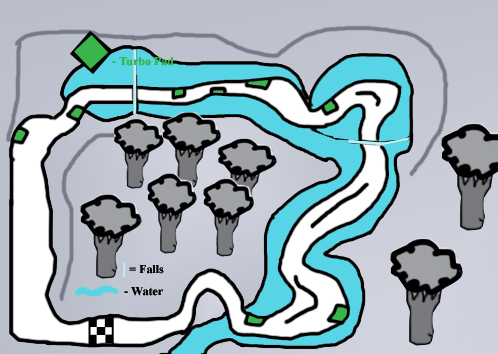 The fairy tale-themed portion of the adventure mode. 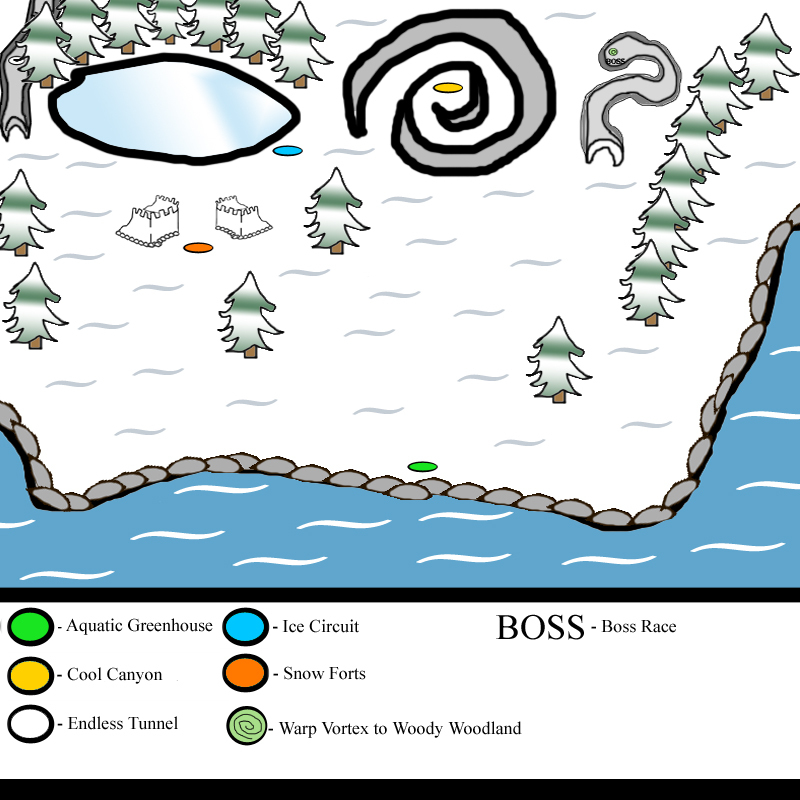 The elemental-themed portion of the adventure mode. The future-themed portion of the adventure mode. 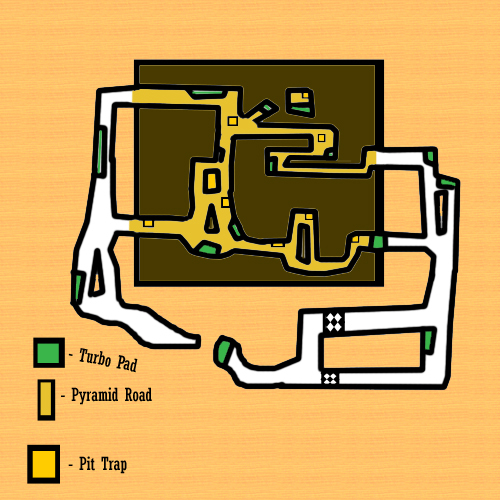 The historic-themed portion of the adventure mode. You have now reached the Darktonian Realm, however, he is located in somewhere else. And Captain Str00del decided to challenge you instead. Before you arrive here, Darktan appears on a big screen and says that he's actually located at the other side of the Darktonian Realm, which is where you currently are located, Darktan is waiting for you to challenge him. You can also challenge other racers as well in Snowball cups as long you have all of the puffle tokens. This world is unlocked after defeating Darktan once. Items can be earned by smashing an item box found on the race track and battle arenas. Occasionally, the items will have three ammo, this can be happened to any item randomly after the player smashes an item box. The weapon can be activated by pressing the 'A' button on the Viimote. If the player collects at least 10 coins, the player is able to 'Mix Up' the weapon to improve it. 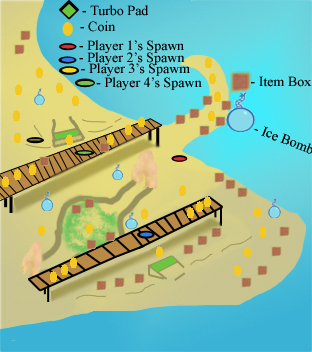 The coins can be obtained by smashing a plain box with a coin symbol on it, or by collecting single coins found on the track and battle arenas. If the player gets hit by a weapon, or fall into a chasm, they will lose a random amount of coins they have depending on the weapon types. Special items can also be obtained if you smash an glowing item box and by pressing the 'A' button, but the glowing item boxes are rarer (and harder to found on the track) than the regular item boxes, the items also have a rarity, when the rarity is 1, it means that it's very common, if it is 10, it means that this item is really rare. You can add more items if you want to. 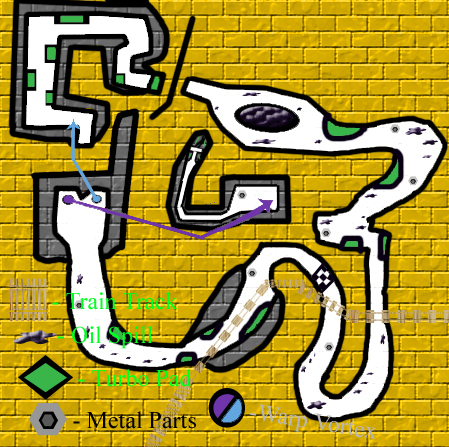 Every two months, new downloadable contents are released which contain new tracks and karts, so in a way the game is never ending. If you play as WitchyPenguin in WitchyPenguin's hut, this music plays. The course, "Another Knightmare" sounds like a pun on "Another Nightmare". In Dorkugese version, most of the music is slower and sounds completely different. There will be a sequel, called Penguin Kart 2. Walrus' vehicle, the Computer Eight, gets its' name from it's statistics, with all of them being eight. 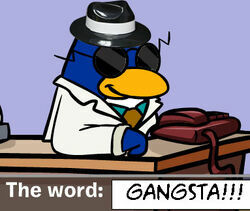 It is recommended for penguins to turn off their sound volume when they use Mabel's special item. While you're racing in Off-road Oncogene or Speed Stadium as Smasher Puffle, you can see Stria, Dr. Betz Cell, and Dr. Boost R. in the crowd. The hidden characters' mugshots are shadowed and their own background is brighter than the usual, it could be because that would make them more of a "secret". Weird. 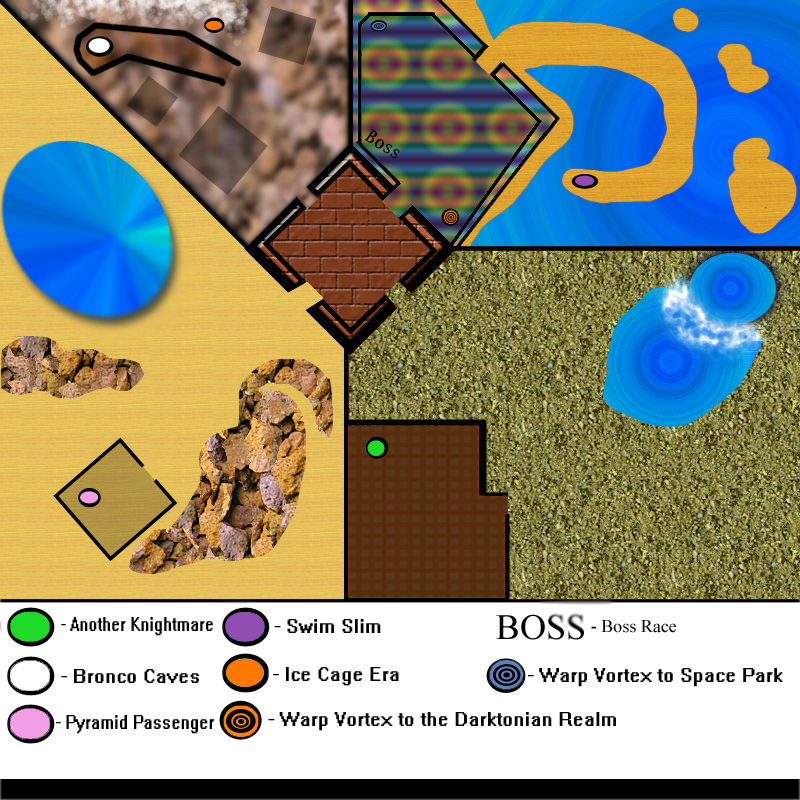 Portraits of Darktan's minions can be seen in the race track, The Darktonian Mansion. The pitfall could not be thrown in a chasm or in mid-air, for obvious reasons. In it, you can make your own karts, plus, you can find any unlockable car customizations in the adventure mode. In the West Pengolian version of the game. When the player leaves the screen idle for five minutes, the cursor transforms into a cursor that looks like a small grumpy and fish-slapping penguin in honor of whoever he was. A shadowed mugshot of each secret characters appears in the cover box, indicating their appearances. In the back of it's cover box, there is a reference to some popular internet meme. Just like in Penguin Kart 2, new downloadabale contents are released every two months, the player can download new stuffs into the game via Wi-Fi. Five extra custom kart pieces. The player can now throw Manny Peng's lollipop when his special item move is activated. 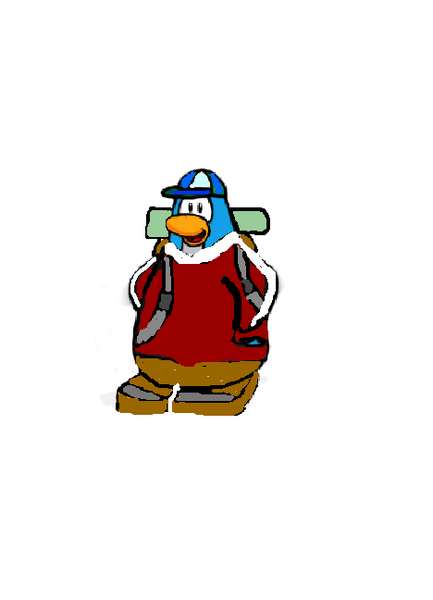 The Petguin character is now named, and has a different appearance. The Character Selection Screen, without the unlockable and hidden characters. This game is an obvious parody of Mario Kart and Crash Team Racing all combined into one. This page was last modified on 3 March 2017, at 10:17.